Reach for this Chocolate Cookie when that next chocolate craving hits. 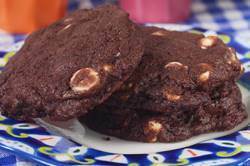 This rich and buttery tasting Chocolate Cookie is adapted from a recipe in Regan Daley's 'In the Sweet Kitchen' and combines the subtle flavor of Dutch-processed cocoa powder with sweet white chocolate chips. While perfect with a tall glass of cold milk, its soft texture makes it the perfect cookie for filling with ice cream so you have your own homemade ice cream sandwiches. Once you have made the chocolate cookie dough, if you do not want to bake the cookies right away, you can freeze it. In fact, this dough freezes beautifully which means you can then enjoy freshly baked cookies on demand. Shape the dough into 1 inch (2.5 cm) balls, place on a parchment lined baking sheet and put in the freezer until the cookies are frozen. Remove the baking sheet from the freezer, place the frozen cookie balls in a freezer bag, and return to the freezer. When you want these cookies, simply place the cookie balls on a parchment lined baking sheet, preheat the oven, and then bake as directed. If you are not familiar with Dutch-Processed or Alkalized Unsweetened Cocoa Powder it is cocoa that has been treated with an alkali to neutralize its acids. Because it is neutral and does not react with baking soda, it must be used in recipes calling for baking powder, unless there are other acidic ingredients in sufficient quantities used. It has a reddish-brown color, mild flavor, and is easy to dissolve in liquids. Its delicate flavor makes it ideal in baked goods like European cakes and pastries where its subtle flavor complements other ingredients. Droste, Lindt, Valrhona, Poulain and Pernigotti are some popular brands. Chocolate Cookies: Preheat oven to 350 degrees F (177 degrees C) and place rack in center of oven. Line two baking sheets with parchment paper. In the bowl of your electric mixer (or with a hand mixer), beat the butter and sugars until light and fluffy (2-3 minutes). Add the egg and vanilla extract and beat until incorporated. First sift together the cocoa powder, flour, baking powder, and salt and then add to the butter and egg mixture. Mix just until incorporated. Fold in the the chocolate chips. Using a small ice cream scoop or two spoons, place about 1 1/2 tablespoons of batter on the prepared baking sheet, spacing about 2 inches (5 cm) apart. Bake for approximately 8 - 10 minutes or until the the cookies are still soft in the center but are firm around the edges. Remove from oven and let cookies cool on baking sheet for about 5 minutes before removing the cookies to a wire rack to cool completely. Makes about 24 - 3 inch round cookies.